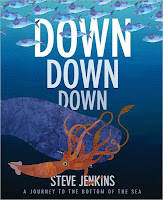 Steve Jenkins is one of those authors who fills librarians' hearts with joy. Why? Because he's a sure bet. A new Steve Jenkins? Yes, please! I don't even have to think about it; I'll take three. Down Down Down is no exception. Jenkins starts with the surface. What kinds of sea creatures leap out of the water to be on our level? Dolphins... flying fish... sharks... Okay, we've seen plenty of books on these animals before. Then Jenkins goes a little deeper. At 10 feet below the surface, we have mackerel and krill. At 33 feet below the surface, the sunlight starts to fade and we have green sea turtles and sailfish. And the deeper we get, the more fantastic, little-known creatures we find. At 1,640 feet below the surface, we have vampire squid and hatchet fish. At 5,000 feet below the surface, we have such terrifying creatures as the deep-sea lizardfish and the hairy angler. And it doesn't stop there! Jenkins is taking us down, down, down... All the way down to the ocean floor. At each ocean level, Jenkins provides information about what animals live there and how they survive. What do fish eat when they live so far below the water's surface that no sunlight ever reaches them? What is the bottom of the ocean like? Each spread features Jenkins's fantastic cut-paper illustrations of the creatures found there. Some are absolutely terrifying*! Kids will pore over Jenkins's detailed illustrations of various creepy creatures. Then they'll turn to the back of the book to find more information about each animal, including scale illustrations. If your patrons are anything like mine, they'll eat up anything about ocean creatures, the creepier the better. Down Down Down won't disappoint. Happy Nonfiction Monday! Wrapped in Foil has the round-up. *Until you turn to the back and realize that the animal in question is smaller than your hand. My one criticism is that I wish the scale had been provided on the actual spreads rather than only in the back of the book. This arrived at my branch right before storytime last week. I was afraid that the parents cooing over it was going to devolve into a shoving match over who got to take it home. Another winner from Mr. Jenkins, for sure. I always have a classroom full of future marine biologists. This looks like a perfect choice for my non-fiction shelf!